Anyone who has seen a Guy Ritchie film knows -- much like Sherlock Holmes -- Ritchie's “mind rebels at stagnation.” Although while Holmes locks himself in his room for two weeks shooting holes in the wall in between cases and groans about needing problems to solve, Ritchie and his editor James Herbert just insert another cool piece of filmmaking trickery by making an unexpected cut in the print of Sherlock Holmes. 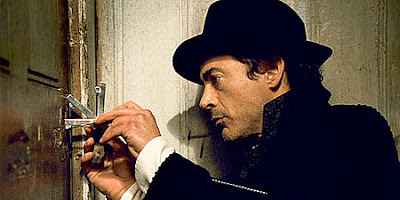 Whether it's slow-motion, freeze frame, unexpected voice-over or something entirely different altogether, Guy Ritchie's work is so signature to the man himself that even in this DVD's Special Features extra, on-set the cast already throws around his name as a style, as if he'd slip and direct it like one of Robert Downey Jr.'s other recent British directors, The Soloist's Joe Wright. And despite the fact that one is never bored when watching a Guy Ritchie movie, headaches and confusion can prove to be side effects of so much flash firing through the celluloid directly into your cornea. Therefore it's not always the ideal approach to ignore stagnation altogether at least for a few seconds or so here and there since it gives our brains a chance to play catch up to the point wherein we can at least pretend we're a fraction as wise as the deductive reasoning genius detective for hire and master observer of human nature, Sherlock Holmes (Downey Jr.). 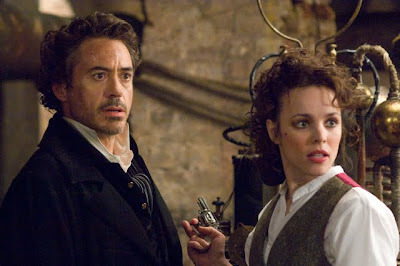 An altogether fun if slapdash, rushed and breathlessly over-the-top adaptation that not only reinvents the traditional film versions and obviously leaves hope that another franchise will develop for the Iron Man himself, Holmes is – and this time to quote its cast rather than my own reviews in the past – a very Guy Ritchie effort. While I applaud the filmmaker's versatility in setting an action adventure crime comedy (and about every other genre mixed into Ritchie's mindscape added together) in Victorian England since it marks an ambitious change of pace from his traditional small time London hoods, turning Holmes into a rapid fire wisecracking, Kung fu battlin' street fightin' man takes a little bit of getting used to from our ingrained image of Arthur Conan Doyle's character. Pouring over his four novels and endless short stories about the detective to cull their own reimagination of how to make Holmes relevant to today's (male) ticket buying audience, we get Holmes as what Downey Jr. describes as a “superhero” of sorts, which works when it's slapstick or as punctuation in a comedic effect and a bit less in some of the endlessly violent and a few shades stronger than PG-13 fight scenes. 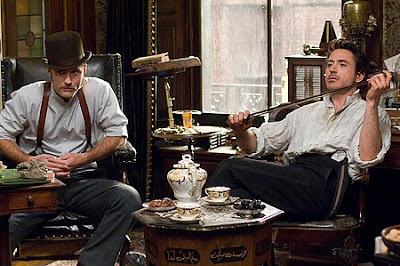 Of course, Holmes was only ever the best he could be with Watson at his side and Jude Law makes an ideal verbal sparring partner for the man, alternately challenging each other and fighting together in a mindboggling case of how a murderer (Mark Strong) managed to survive his execution by hanging. Likewise, the two are distracted by pretty ladies as Holmes must stop passive-aggressively sabotaging Watson over is impending engagement to the lovely Mary (L'auberge Espagnole's Kelly Reilly) and also decipher what – if anything – this case has to do with Rachel McAdams' Irene Adler, incidentally an old flame of Holmes who was the only woman ever to best the famous detective. When the American Irene arrives to hire Holmes to track down a missing person who winds up dead, the plot thickens far more than Scotland Yard can bear. 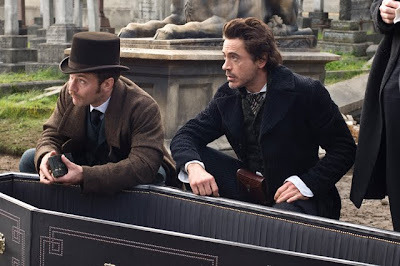 And despite the fact that overall the two beautiful women are wasted in the man's man movie that fits both Ritchie and Holmes' style, the characterization and banter between the fast talking screwball Downey Jr. and Jude Law makes for electric chemistry that helps elevate the work to magical proportions worthy of another case. An acquired taste that doesn't quite work, unfortunately it's all so chaotic and overly involved that you wish Guy Ritchie's mind didn't rebel quite as much as it does to the point where Holmes' 128 minutes contains enough action to have made two wholly unique, infinitely better paced, and perhaps more intellectually satisfying works.